We now have available our 2017/2018 general catalogue packed full of established products and many new ones. These include quarter-turn locks and latches, an extensive modular program of swinghandles with matching rod locking systems and enclosure/cabinet sealing gasket profiles. Substantial space is given over to hinges for prominent and flush doors. The catalogue is available free in printed or online forms. Typically the new EMKA catalogue also details our stainless steel range of locks and hinges and the toggle latch and hook programs. We have followed through in this catalogue with a specialist range for the HVAC industry – complimented by other industry specific ranges for Transport and Electronic Data Centre security which are covered in separate brochures. As befits one of the world’s foremost enclosure hardware manufacturers, this 2017/2018 catalogue also deals with our custom production capability. A wealth of information is included regarding standards, certification, industry terminology and best practice, e.g. regarding gasket usage. 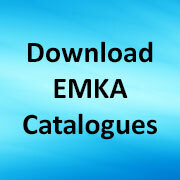 The new EMKA catalogue can be obtained free from us by calling 024 7661 6505, by email to: emka@emka.co.uk or downloaded from our website at www.emka.com/uk_en/products/download/industry/. 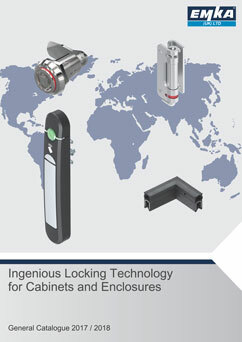 Share the post "Our new Catalogue has even more ingenious locking technology – locks, handles, hinges, swinghandles and gasket for cabinets and enclosures"